Although the early history of Portchester is uncertain, the town was undoubtedly the Mother of Portsmouth. According to Higden, the Monk of Chester, Peres and his elder brother Ferrex, sons of an ancient British king fought for the crown and Ferrex was slain. 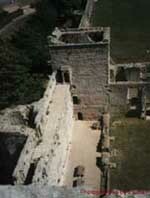 Peres then built Caer-Peris, by which name Portchester became known to the Britons. This event is said to have happened about 491 B.C. The first reference to Portsmouth as a naval station was made in 286 A.D., when a sea captain named Carausius, who had been sent by Rome to suppress piracy, became a master pirate himself. He assumed Imperial power and even had his own coinage minted. He was eventually killed by a rival, and then Rome sent a great force to crush the rebellion. This was accomplished, and then, realising the commanding position of Portchester, the Romans developed it as a naval station.